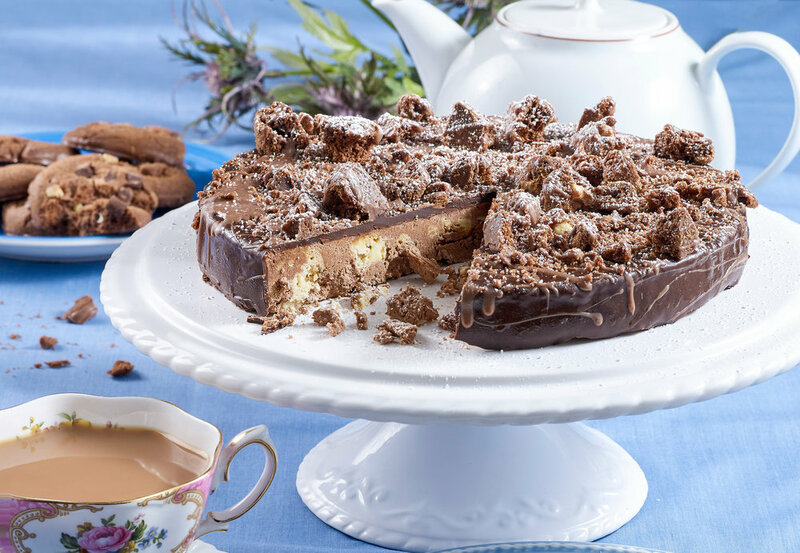 To celebrate the Queen's official birthday, Iceland have put together this recipe for her favourite chocolate biscuit cake for just £5.97! Lightly grease a 6-inch-by-2½-inch cake ring with the butter and place on a tray with a sheet of parchment paper on the bottom. In a large bowl, combine the butter and sugar until the mixture starts to lighten. Melt 1 bar of orange chocolate and add to the butter mixture, stirring constantly. Fold in the white chocolate cookies biscuit until they are all coated with the chocolate mixture. Spoon the mixture into the prepared cake ring. Try to fill all of the gaps on the bottom of the ring because this will be the top when it is un-moulded and chill for 3 hours. Meanwhile, melt 1 bar of orange chocolate. Slide the ring off the cake and turn it upside down onto a cake wire. Pour the melted chocolate over the cake and smooth the top and sides using a palette knife and allow the chocolate to set at room temperature. Carefully run a knife around the bottom of the cake where the chocolate has stuck it to the cake wire and lift it onto a serving plate. Melt the bar of milk chocolate, use to decorate the top of the cake and place on the broken quadruple cookies. The solid chocolate may be difficult to cut into slices, so run your sharp knife under hot water to cut the cake easier.